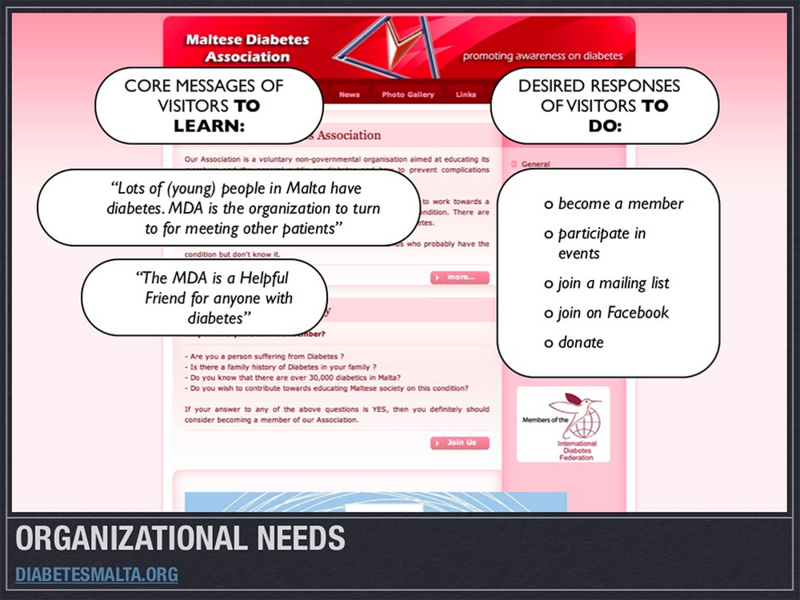 Last week I went to Malta and presented the methodology I used for assessing the websites of 10 Maltese voluntary organizations. This post gives an overview of the questions you should answer when performing such a webaudit yourselves. 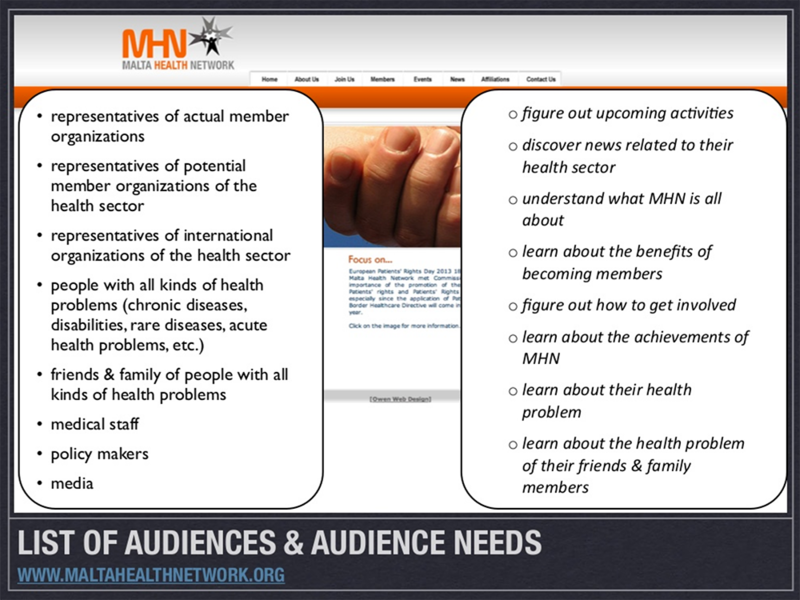 1. Who are your audiences & what are their needs? 3. 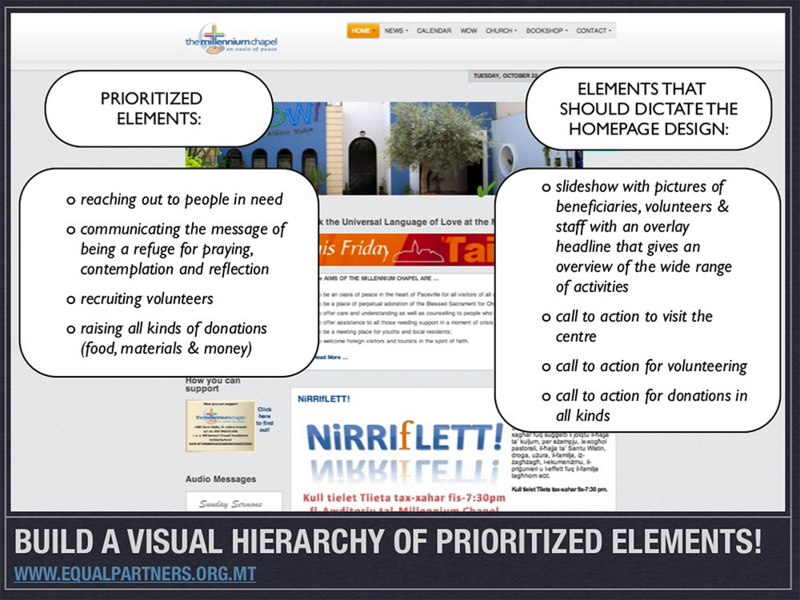 Which elements should primarily dictate the design of your homepage? The design process of a website can only succeed when the core messages and desired responses dictate design decisions. An improvised approach results in messy layouts with no clear focus. As a result, audiences don’t know where to look. When feeling overwhelmed with too many choices, audiences tend to choose none— they simply give up! To avoid confusing the visitors, it is extremely important to prioritize desired responses: the elements to be emphasized have to be established or prioritized. Good site layout will translate the prioritized desired responses into visual hierarchy— some elements are emphasized in relation to others. Good designers use size, color, and negative (empty) space, among other things, to create emphasis. The skillful use of these techniques serves to guide the visitor’s eye. 4. 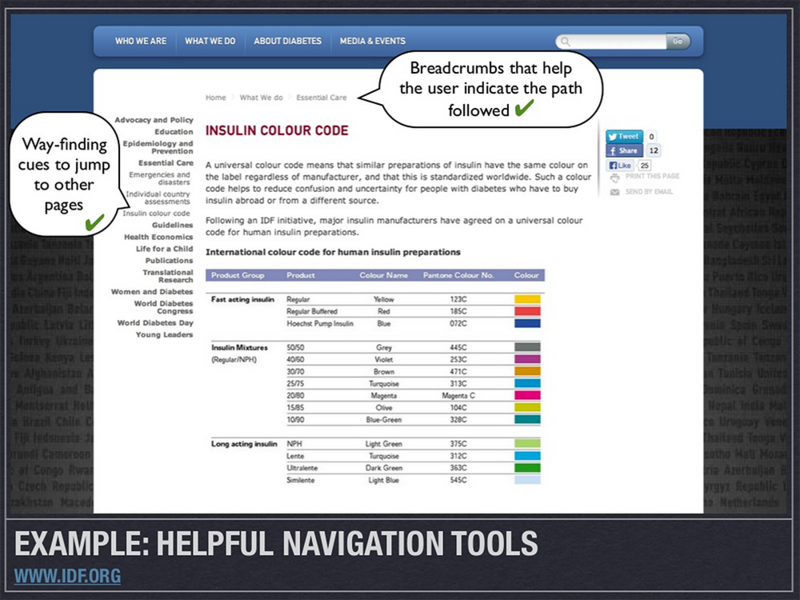 Which helpful navigation tools are lacking on your website? 5. 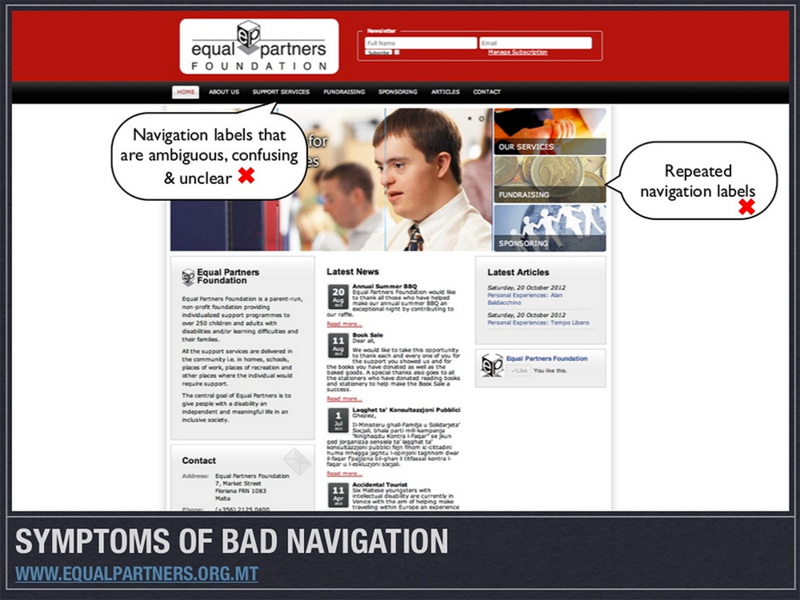 Which symptoms of bad navigation are present on your website? 6. 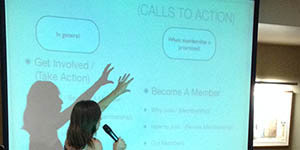 Are your calls-to-action landing on pages designed for conversion? 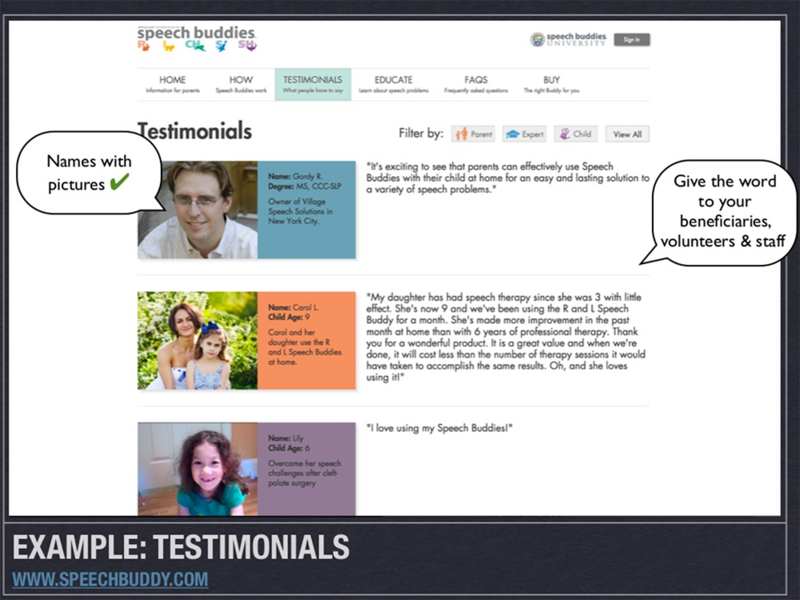 “Conversion” is a marketing term meaning “desired responses that are successfully met”. A conversion-oriented page (or “landing page”) is a page on your website where you want visitors to fulfill your calls-to-action, such as donating money or joining an email list. 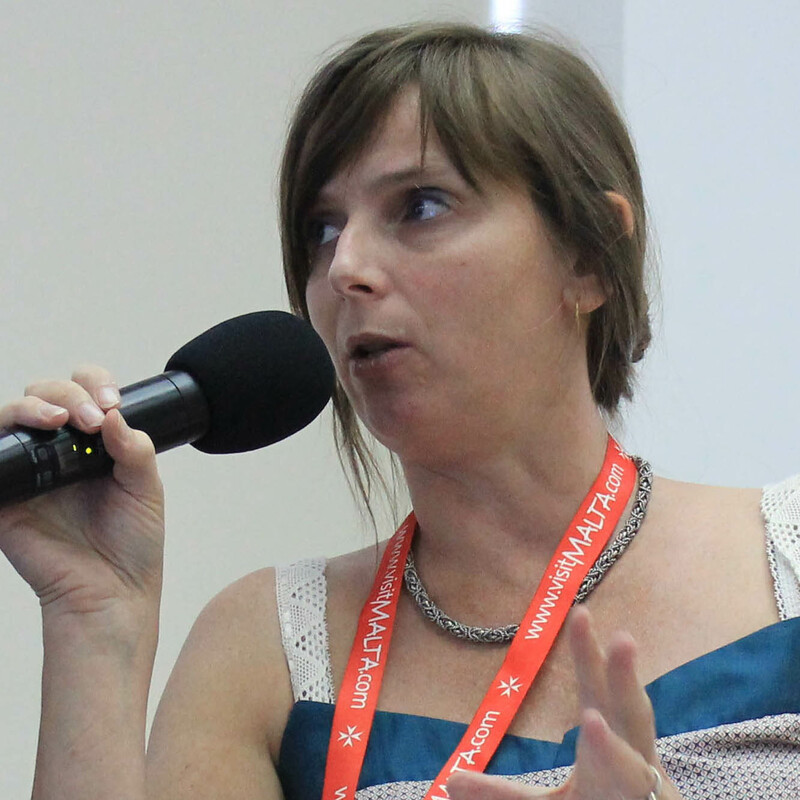 Use a compelling image – preferably a single person looking directly at the user. 7. Does your content connect with your audience? Some organizations create content they (not their audiences) would want to see or read. No matter how much you love your content, visitors won’t consume it if it doesn’t address their needs and interests. Keep your content brief and to the point and avoid repetition. Long-winded text, generic images, and boring videos are some examples of content that will cause your audiences to lose interest. Tell a story that moves people. Use the second person: write your copy as if you’re writing a personal email. Use awesome images for your stories and on each of your webpages. 8. 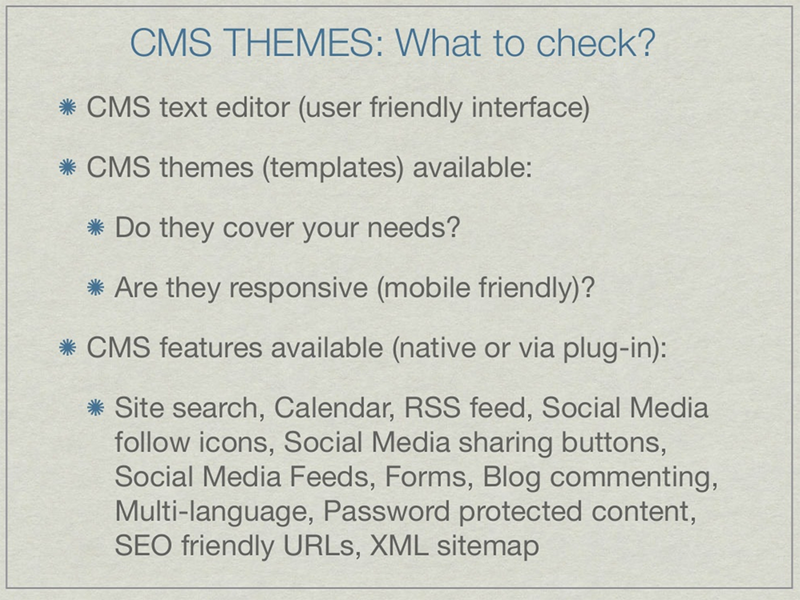 Does your CMS system & theme include all the features you & your visitors need? Using a CMS system is not only recommended for updating your content in an easy way, also the aspect of designing the website can happen in a very smooth, flexible and cheap way. Large communities of web designers have gathered around the most common used CMS systems (WordPress, Joomla & Drupal) and offer their designed graphical template (also called ‘theme’) for prices that are either free or low-cost (also called ‘premium’). A responsive or mobile site is no longer a nice-to-have, it is extremely important because in the near future the majority of your website traffic will occur on a mobile device. Depending on your needs, your CMS system should contain all the technical features (native or via plug-in) that ensure your website serves its purpose and end users can do what they need to do on your site. 9. 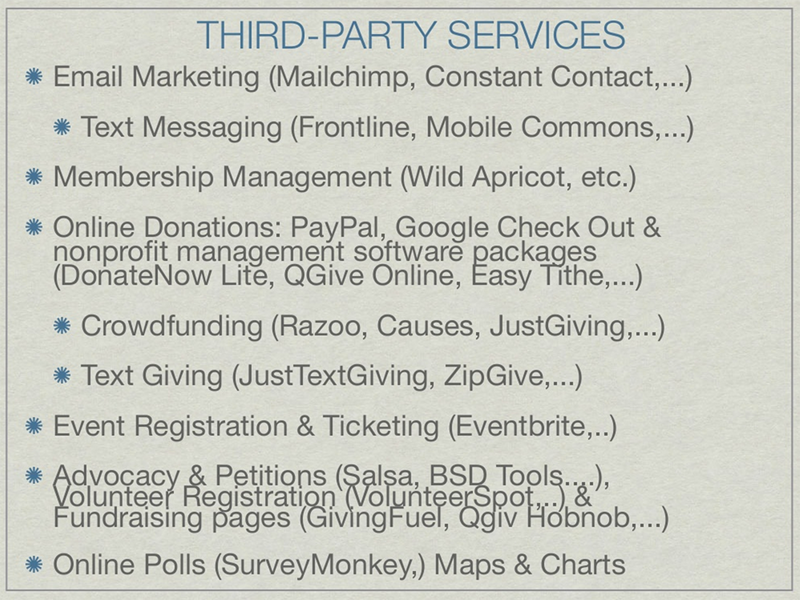 Which third-party services you & your visitors need? The more sofisticated the CMS system of your choice, the more it will be able to answer your technological needs, but the more complicated and expensive it will become to install and configure the system. 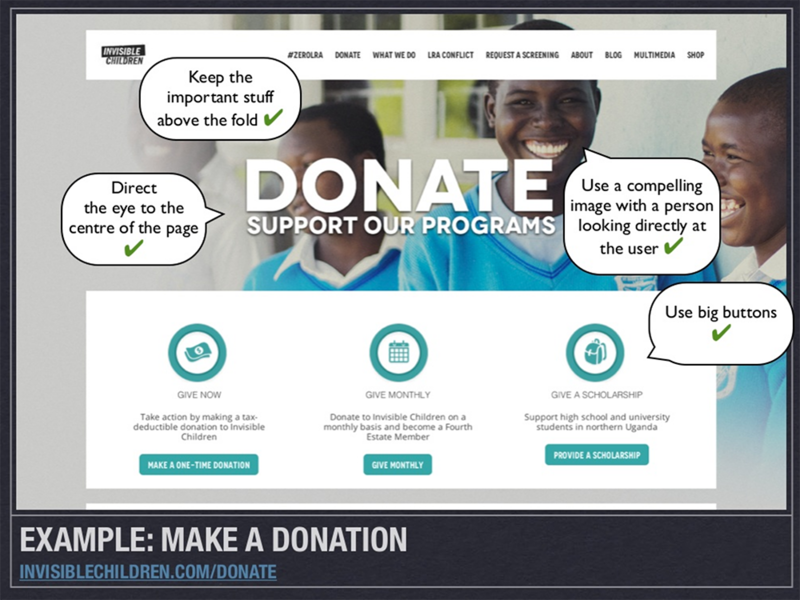 Opting for a more basic CMS system together with a third-party solution for specific technological demands can be a good solution for smaller nonprofits. From email marketing, to membership management, online donation tools, event registering, advocacy tools or online polls & forms – a whole range of third-party services exist out there to create a functional online experience for your visitors.